Hiring talent with the right fit of skills and outlook is always a constant, pressing issue for startup companies. Ben Chew, an entrepreneur and angel investor, founded StartupJobs Asia to help overcome the hiring barriers and aims to form the bridge between potential employees and startup founders. Founded in late 2012, the hiring platform allows startup company founders from various parts of Asia to list their job openings in the database for free. To make things even clearer, all job listings are conveniently broken down into various categories, such as full-time, part-time, freelance, temporary, and even internships. Another feature which might be useful on Startup Jobs Asia is the availability and abundance of social media platform share buttons on every single job description page to encourage the sharing of jobs that might be of interest. This is a function that many current job portals lack, with most having just a simple ‘share via email’ feature, or social media sharing buttons tucked and hidden away within sub-pages. 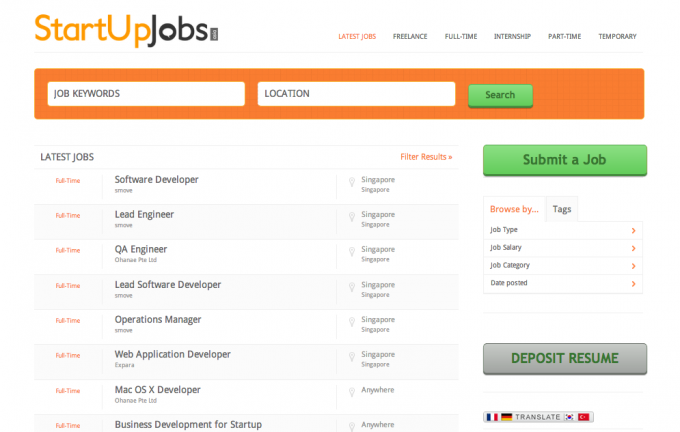 Startup Jobs Asia recently added brand-new resume deposit feature to the site, which allows job seekers to upload their resumes into the database. From this pool of CV’s, startup founders are able to select their ideal candidate for a position. According to Ben’s prior experience in the hiring field, he mentioned that there’s a large number of passive talented individuals when it comes to job-searching and pursuing a career change, not forgetting those job-seekers who already have a mainstream career but are still open to the idea of venturing into startup companies. We see that this alternative process is becoming an increasingly popular process for talent search among startups as the talent crunch continues to be a constant challenge in this part of the region. This new feature would enable startup companies to make the first move in approaching potential candidates after searching through their profiles and resumes, thus making job matching effective for both active and passive startup job seekers in Asia. Article first appeared on TechinAsia.